No soldiers shall, in time of peace be quartered in any house, without the consent of the owner, nor in a time of war, but in a manner to be prescribed by law. Nevada homeowner filed a federal lawsuit stating that the police allegedly invaded his his third amendment rights. After they forcibly entering his home to gain a "tactical advantage" while trying to resolve a domestic violence incident next door. 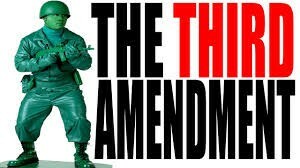 It is unclear if police count as "soldiers" under the amendment. Nor is it clear whether the 3rd amendment applies to the states at all. Decision: Still being decided. North Dakota homeowner, John Anderson, filed a federal court case yesterday afternoon, stating that his third amendment rights were violated. After the police barged into his home to conduct a 24 hour stakeout, on the house across the street as it was believed to be a meth lab, without his consent. The first court date Anderson is to attend will be December 16, 2014. It is unknown if the court will consider the officers as soldiers as it states in the amendment. Or if this even applies to the states at all. Outcome: Court decided Anderson's third amendment rights had not been violated, due to the fact that the officers weren't considered soldiers. Although the officers should've asked for his consent they were free to go at the end of their final day of trial.